Light rain (total 4mm) at first, then becoming colder with a dusting of snow on Sat afternoon. Freeze-thaw conditions (max 5°C on Mon morning, min 0°C on Fri night). Wind will be generally light. Heavy rain (total 81mm), heaviest during Wed afternoon. Later becoming colder with a dusting of snow on Thu afternoon. Freeze-thaw conditions (max 6°C on Tue morning, min -1°C on Thu night). Wind will be generally light. A heavy fall of snow, heaviest during Sat night. Becoming milder with heavy rain (total 27mm) on Sun morning. Freeze-thaw conditions (max 4°C on Fri morning, min -1°C on Thu night). Winds increasing (light winds from the SW on Thu night, fresh winds from the SSW by Mon morning). 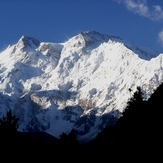 This table gives the weather forecast for Nanga Parbat at the specific elevation of 3500 m. Our advanced weather models allow us to provide distinct weather forecasts for several elevations of Nanga Parbat. To see the weather forecasts for the other elevations, use the tab navigation above the table. For a wider overview of the weather, consult the Weather Map of Pakistan.